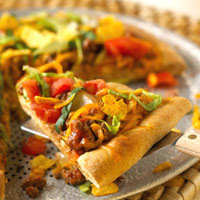 This family-pleasing recipe makes two hearty pizzas each generously topped with taco fixings. In a large bowl combine 1-1/4 cups of the flour, the yeast, and salt. Add warm water and 2 tablespoons oil. Beat with an electric mixer on low speed for 30 seconds, scraping bowl constantly. Beat on high speed for 3 minutes. Using a spoon, stir in cornmeal and as much of the remaining flour as you can. Grease two 11- to 13-inch pizza pans or baking sheets. On a lightly floured surface, roll each half of dough into a circle 1 inch larger than pizza pan. Transfer dough to pans. Build up edges slightly. Flute edges, if desired. Prick generously with a fork. Do not let rise. Bake in a 425 degree F oven for 10 to 12 minutes or until lightly browned. Meanwhile, in a large skillet cook ground beef and onion until meat is brown and onion is tender. Drain fat. Stir in tomato sauce, olives, and taco seasoning mix; heat through. Spread ground beef mixture over hot crusts. Sprinkle with cheese. Bake about 12 minutes or until cheese melts. Top with lettuce, tomatoes, and avocados. Spoon sour cream into center of each pizza. Sprinkle sour cream with chili powder, if desired. Makes 6 servings. Prepare pizza dough; divide into 2 equal portions. Place in plastic freezer bags. Seal, label, and freeze up to 1 month. Thaw overnight in refrigerator before using. Calories 726, Total Fat 45 g, Saturated Fat 15 g, Cholesterol 90 mg, Sodium 1274 mg, Carbohydrate 56 g, Protein 32 g.
This entry was posted on 10:37 PM and is filed under Beef . You can follow any responses to this entry through the RSS 2.0 feed. You can leave a response, or trackback from your own site.